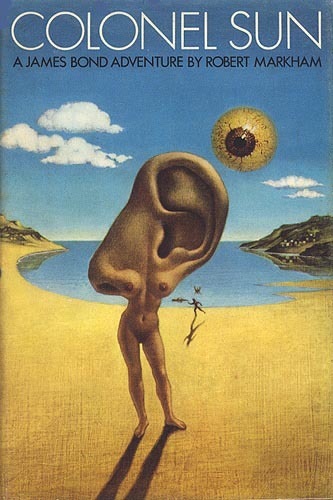 Here's the original cover art for the very first James Bond continuation novel, Colonel Sun (1968) by Kingsley Amis writing under the pen name of Robert Markham. The cover art is by Tom Adams and is pretty freaky, but effective. Both the UK and U.S. editions used this artwork. The art extends around the book and includes a melting Walther PPK (you can see the full image at Tom Adams Uncovered). Colonel Sun find James Bond in action in Greece after M is kidnapped from his home in London. While the book wasn't all that received in its day, many Bond fans have come to deify it as the best James Bond continuation novel. I can't say that's an opinion I share (I might actually hand that honor to John Gardner's Icebreaker, having just re-read it), but I enjoy Colonel Sun. In fact, I'd say it's time for a reprint. Colonel Sun is very well executed but in spots seems too dry to me. Like you I very much enjoyed the book but also like you I would not say it's the best continuation novel. There are 4 or 5 other JB Books I enjoyed more. I will say for whatever reason the Daily Express adaptation ended up being one of their very best however. Back in the sad old pre-internet days, I discovered "Colonel Sun" purely by accident one day when I was in a thrift store with an aunt. I was maybe twelve or thirteen, and I was looking through the stacks and stacks of paperbacks. My eye saw the words "James Bond" and stopped. Then I saw the title "Colonel Sun," and I was shocked to find that there was a Bond novel I'd never heard of! I'd read all the Flemings and all the Gardeners, so this was an absolute delight. I still think it's a pretty good novel, too. Maybe not THE best continuation novel, but certainly in the upper echelon.